Why is the gang so tired this week? Probably because Josh and Mandi helped the Reverend move into a new apartment, while Julian got all excited about biking. We tell you all about that before reminiscing about childhoods filled with tree houses, video games, and LEGO bricks, which transitions well into our topic for the week. We come back from the break ready to fill your head with factoids about the LEGO video game series. 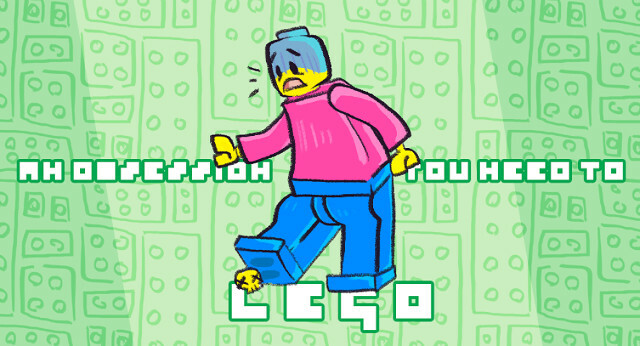 What was the first LEGO game? (Hint: It wasn’t LEGO Star Wars.) Why did it take so long for LEGO games to become a thing? Why has the franchise become so popular? What are our personal favorite games in the series? Plus, we’ve got some info on LEGO games that died in development, wishes for a LEGO Die Hard game, and the definition of Poop Dunk (sort of). We’ve built a full episode about LEGO, so give it a listen! I remember that advert you used at the start, though I can’t imagine how you dug it up. As for the podcast, I don’t know much about LEGO games but I always enjoy hearing the information you provide. I hope you’re able to get some rest soon. That commercial was from 1970! We’re really good at digging up old stuff! I remember that Lego Island game. My favorite thing to do was to build a flying device than crash into a busy area, lol. I’d play it if they made a new one. I play the LEGO games with my nephews sometimes, but I’d have to buy LEGO: Die Hard for myself. LEGO Die Hard would be the best, right? A Lego game on the SNES or Genesis would of looked really good. It’s too bad they never made one. Quite honestly I’d rather have virtual Lego than a proper Lego game. Lego sets are aces but I feel a bit silly playing with toys. of blocks? It was like the rollercoaster tycoon game but with legos. Do you mean Legoland? I never played it, but I bet I would love it!